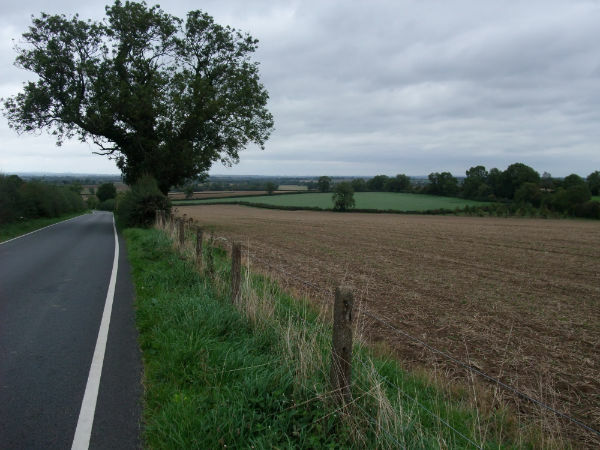 The Benford’s of Leicestershire and Beyond…. Clara Benford, born 1836, was one of 10 children born to Nathaniel and Ann Benford of Claybrooke Magna, Leicestershire over a span of 21 years. She was my Great Grandmother and married John Perkins in St. Peter’s Church June 6, 1859. I have spent the past 10 years researching this family and have traced many of the lines into the 21st Century. At the same time, I was working backwards to discover the origins of this family in Leicestershire. 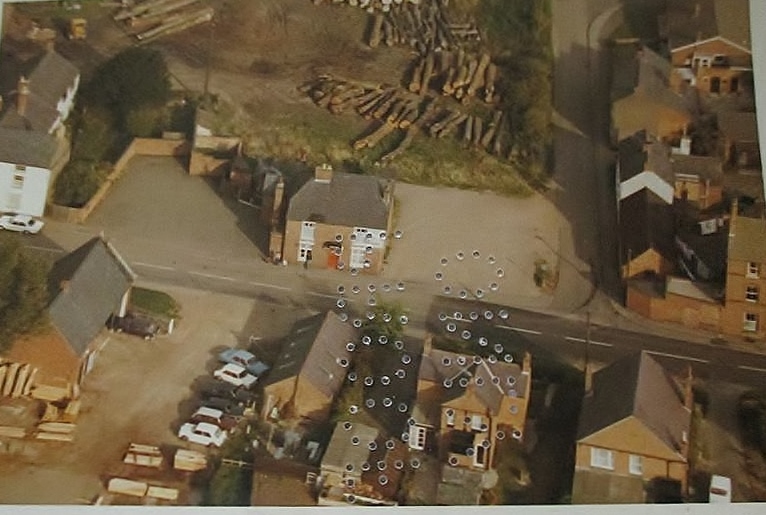 There appeared to be no Benford’s in the Claybrooke/Ullesthorpe Parish records in the early 1700’s and I had decided, it was possible that a Benford had married into the villages from elsewhere. Warwickshire and Northamptonshire were good possibilities. There were Benford’s in earlier Parish Records in both these counties. 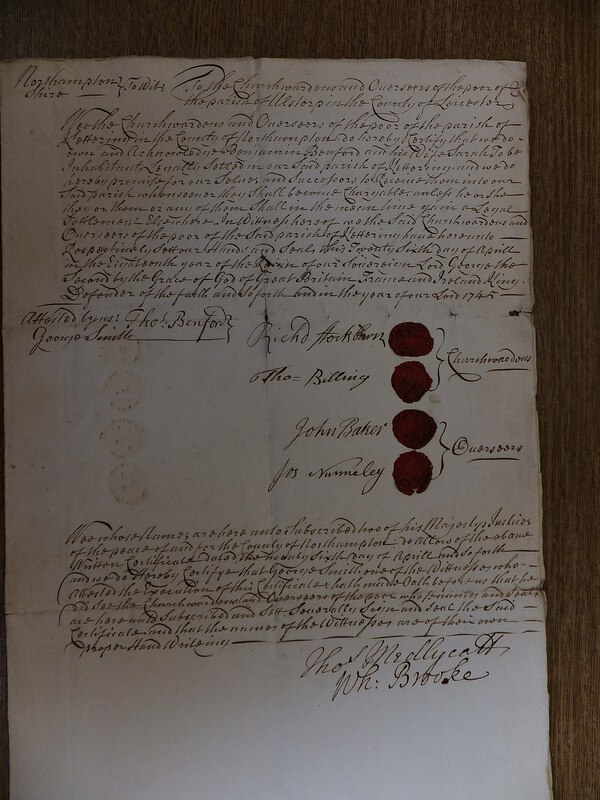 In 1745, one such Certificate was issued to Benjamin Benford and Sarah (Page) Benford of Kettering, Northamptionshire and was addressed to the Church Wardens of the Parish of Ullesthorpe in Leicestershire. Benjamin had been born in Kettering in 1714 to Thomas and Sarah (Stanley?) Benford. On January 3, 1745 he married Sarah Page of Ullesthorpe. 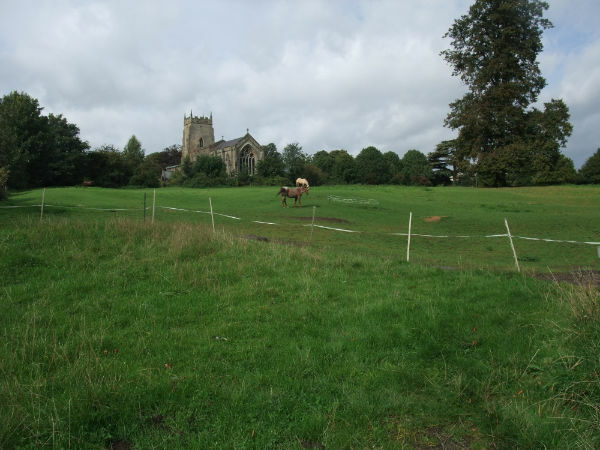 In order to settle in Ullesthorpe, the family would need a Settlement Certificate. This Certificate answered my question….Was Benjamin was from eleswhere? It seems this was the case… And just like like in the Bible…Benjamin begat Nathaniel in 1748, Nathaniel begat Nathaniel in 1774, and Nathaniel begat Nathaniel in 1804 who begat the 10 children I am going to tell you about. I will begin with William Benford. He was christened April 3,1833 at St. Peter’s in Claybrooke Parva. His life was short and he died in August 1847. My Great Grandmother Clara Benford was born in October 27,1836. She married John Perkins in St Peter’s Church June 6, 1859. Her two sons, John Thomas (2Jun1863) and Walter Joseph (4th Qt 1864) were born in Claybrooke Magna, where John was the village Blacksmith. On the 1891 Census she and her husband have taken in 3 children of her brother Thomas Benford who died in a railway accident in Cheshire. They are Ellen (13), Alfred (7) and Annie (5). Ellen, later known as Nellie, remained a spinster and stayed with the family her entire life. Clara died in 1910. 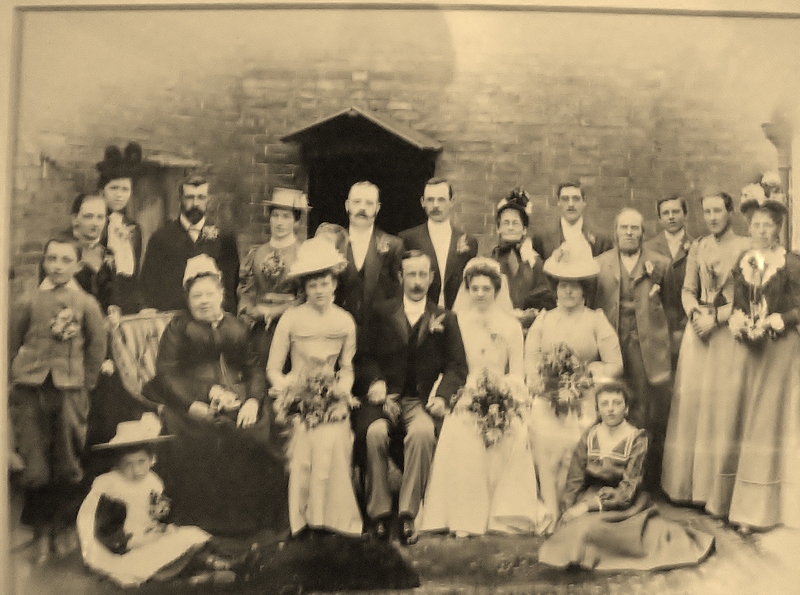 Wedding of John Thomas Perkins and Sarah Jane Sleath… June 5, 1901. Clara Benford Perkins (front row), Nellie Benford, John Thomas Perkins, (Clara’s Son), Sarah Jane Sleath and Bessie Tyres. Walter Perkins (Clara’s second son) standing just left of Nellie. Eliza Benford is christened September 14, 1845. On the 1871 Census, following the death of both her parents, 26 year old Elizabeth (Eliza) is living with her brother George. William Bird, a Blacksmith, is a lodger next door. In 1875 she and William marry. Their first child Annie was born in 1877. William was from Brinklow, Warwickshire and was apprenticed to John Perkins, the village Blacksmith. 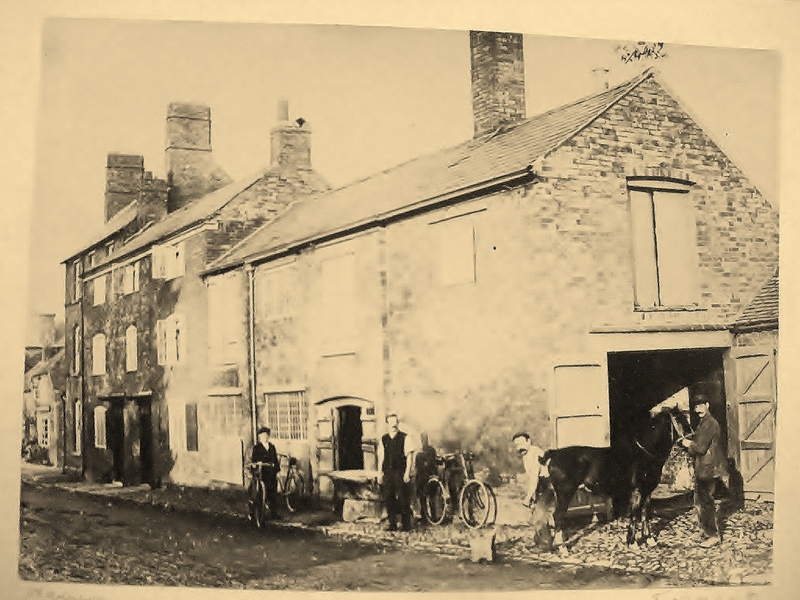 S0metime after 1881, the family moves to the Plough Inn, Willey where they remain for the rest of their lives. 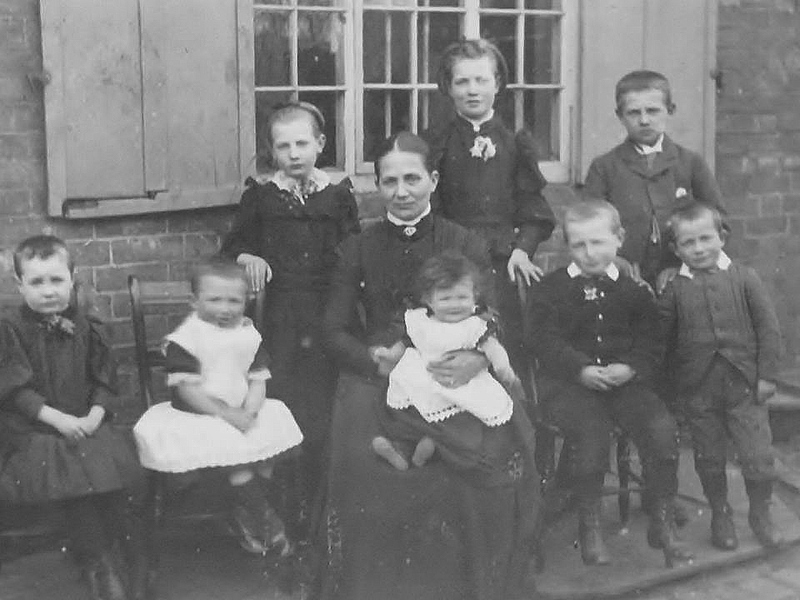 They have 5 children…Ann 1877, John 1881, Charles 1883, William 1887 and Ethel 1889. Royal Oak owned by George Benford. Thomas Benford was the 4th son. He was christened September 29,1850. He had moved to Witton, Cheshire and was working as a Railway Clerk. On September 22, 1875 he married Elizabeth Chadwick at St. Nicholas Church in Halewood, Cheshire. He had been promoted to a Station Master. 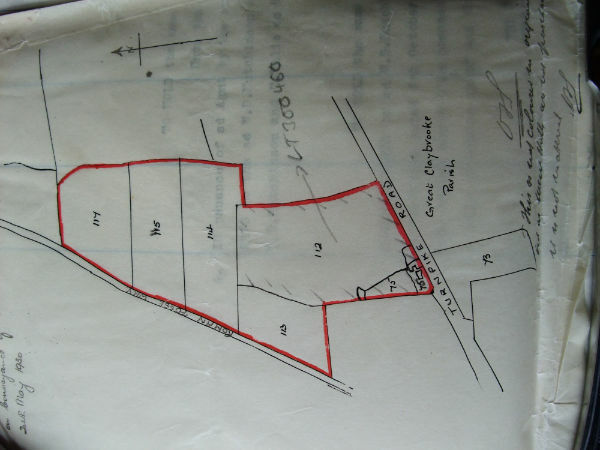 On the 1881, the family was living in Northenden. There were 3 young children along with Elizabeth’s widowed mother Mary. The family would be struck by a double tragedy in 1890. In April as he was walking beside the Cheshire Railway Lines, Thomas was struck and killed by an express train from Manchester. He was 40 years old and left a widow and 5 children. Tragedy struck again in June when Elizabeth died leaving the children orphans. Mary Hannah went to live with Edwin Benford, Nellie, Alfred and Annie go to live with Clara Benford Perkins and Elizabeth , the eldest Elizabeth, was adopted by the Station Master from Northenden, Thomas Senior and Emily, his wife. She was 14. Alfred Frederick Benford was christened in 1852. Following the death of his parents, he went to live with his brother George. On the 1871 Census he was working as a carpenter. He died at age 22 in 1874. Elizabeth (Betsey) Benford was born in 1854. Following the death of her parents she went to live with her brother George. On the 1871 Census age 16, she is working as a dressmaker. In June of 1878, she marries Arthur Edwin Richards. By the 1881 Census the family is living in Leicester. Arthur is an Ironfounder, son of William Richards, owner of W. Richards and Co which was founded in 1844. They eventually have 5 children. There were a number of Iron Foundries in Leicester and Richards, in later years, the company specialized in steel roofing, railway and road bridges, and engine and wagon turntables. They eventually have 5 children…Elizabeth 1880, France M 1886, Grace Hilda 1888, Ellen A 1891, William Benjamin 1892 and ida Doris 1899. 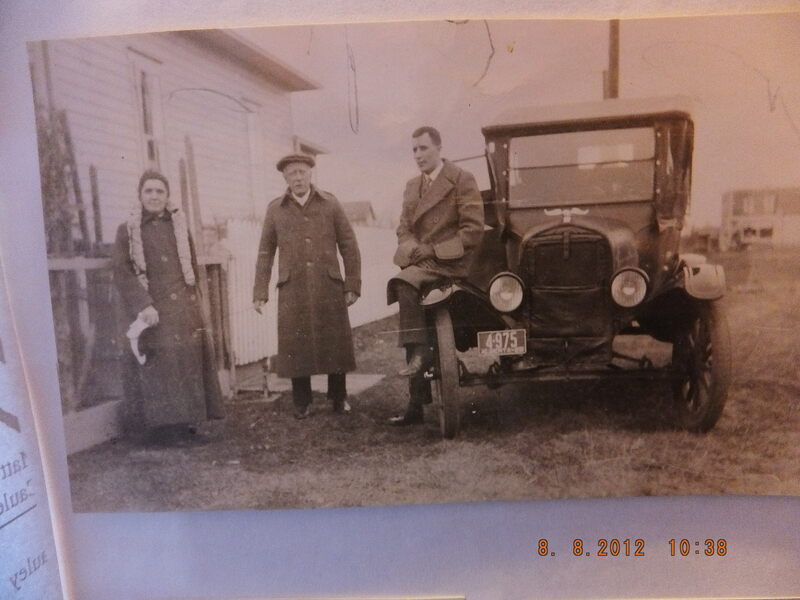 Clara Benford Perkins’ son John Thomas, His wife Sarah and son Tertius at their home in Canada in 1929. There is also the story of the first Benford’s back in the 1600 and 1700’s…this one is more difficult to research and tell, but it is not impossible. Were the Leicestershire Benford’s connected to the Benford’s in the Parish Records for the Silver Street Baptist Church in Kettering in the 1700’s as I believe? There was a Thomas born c. 1710, a Benjamin born c. 1716 and a John born c. 1719. There is also a Nathaniell Bendford? christened at Theddingworth in 1714….were they all Children of the same parents…Thomas and Sarah Benford? If anyone reading this blog notices mistakes in dates, names or other details or can add to my information, please let me know. I would als0 like to thank those that had posted pictures on the Old Pictures of Claybrooke Facebook page. I have included a couple to put faces to names. 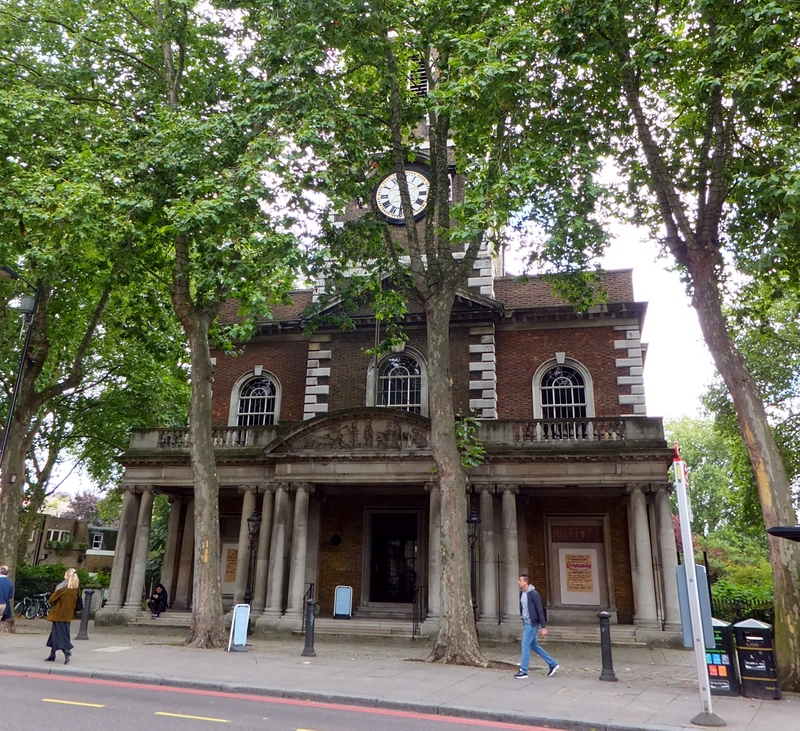 I first discovered Islington in 2010 when I went to London with the London Trippers, a group of diehard Family Historians, who think spending the day in the depths of the Archives is the only way to go. 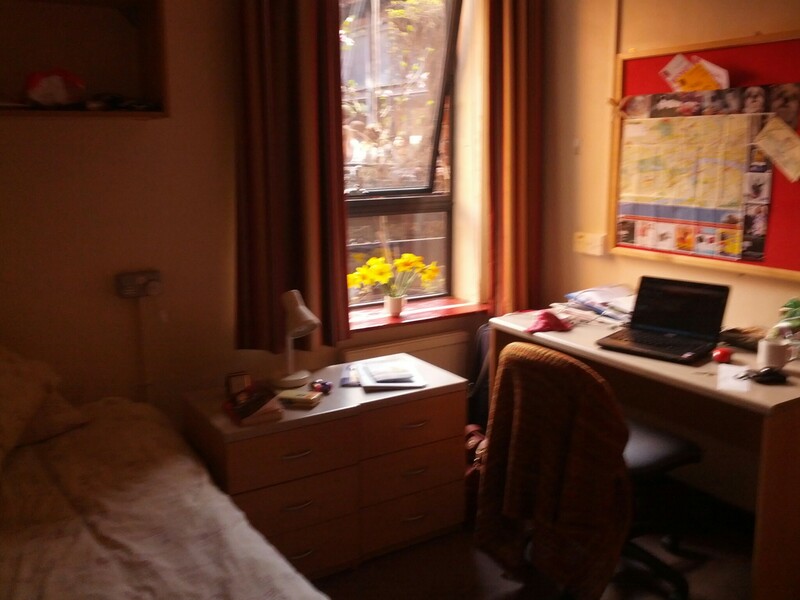 We were staying at Rosebery Hall, one of the Residences belonging to the London School of Economics. 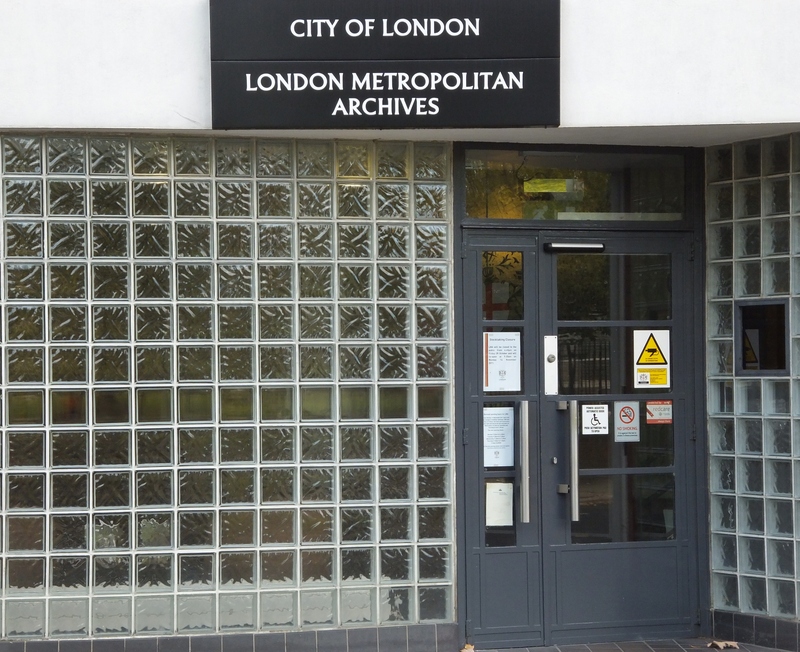 Many of the archives were within walking distance, which was why earlier groups recommended this as the place to stay. 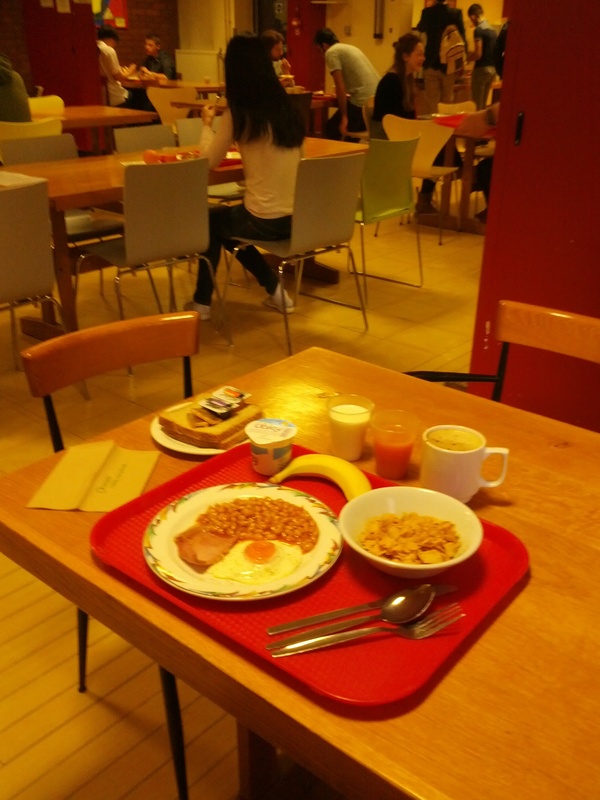 Also, even though it was not always clean and things didn’t always work, it was cheap and offered a Full English Breakfast and if you took a baggie, you would have enough food for lunch. This spring was my 5th visit since 2010 and I think of the Hall as my London home away from home. The price was up to 45 Pounds a night, but it is still a steal in London. Until my visit in 2013, I wasn’t aware that Islington had been home to some of my Ancestors who, I thought, lived and died in Warwickshire. Since then I have learned otherwise…people MOVE…they have always MOVED and in 1776, they were no different. In 1965, the Borough of Islington was created by incorporating some of the old parishes where my Mason Family once lived. It now takes in Clerkenwell, St. Luke’s, Canonbury and Pentonville as well as others. 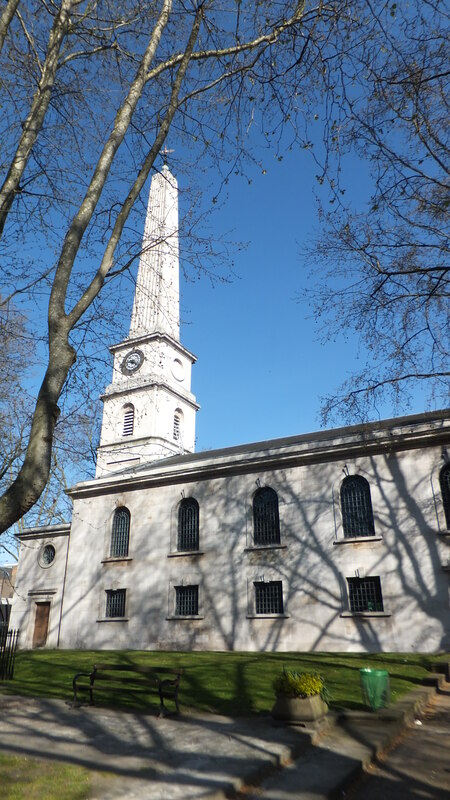 If you begin your walk on Old Street, just a few steps from the SOG..Society of Genealogists, one of the other spots I hang out, you come across St. Luke’s Church. It has been decommissioned…and is used by the London Symphony Orchestra for their community and music education programs. In the late 1700’s, Spencer and Martha Mason from Warwickshire had 10 children baptised there between 1777 and 1795. 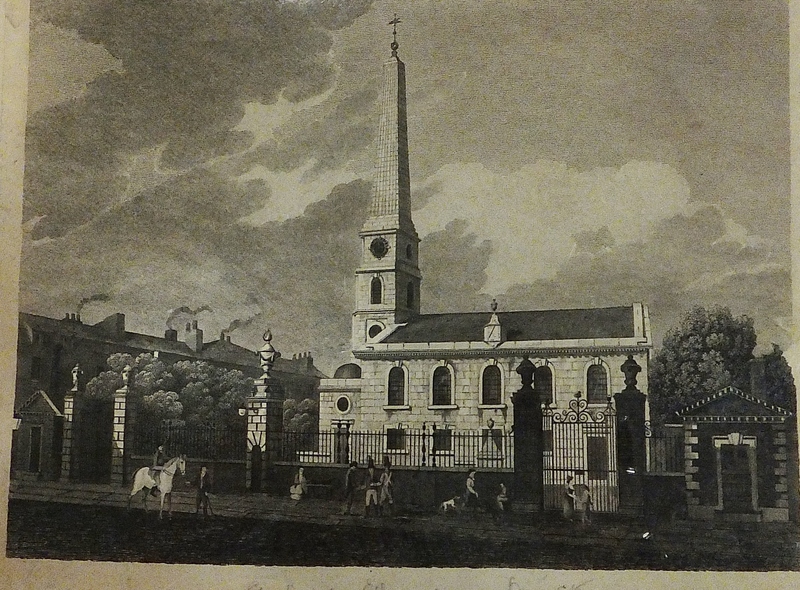 The first was John, christened in 1777 and the last Eliza, christened in 1795. The child that I have been able to trace is Daniel Spencer Mason, christened in 1793. Spencer Mason was a Baker, and as such was a member of the Mercer’s Guild. It was this organization that provided the funds for his youngest son, Daniel Spencer Mason, to attend St. Paul’s School. 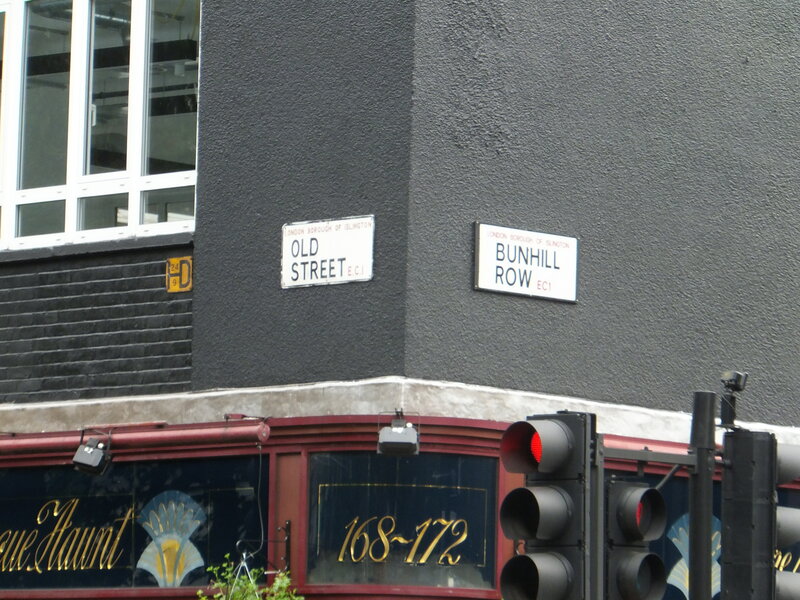 Old Street today where Spencer Mason once had his bakery. Spencer died when Daniel was only 9. 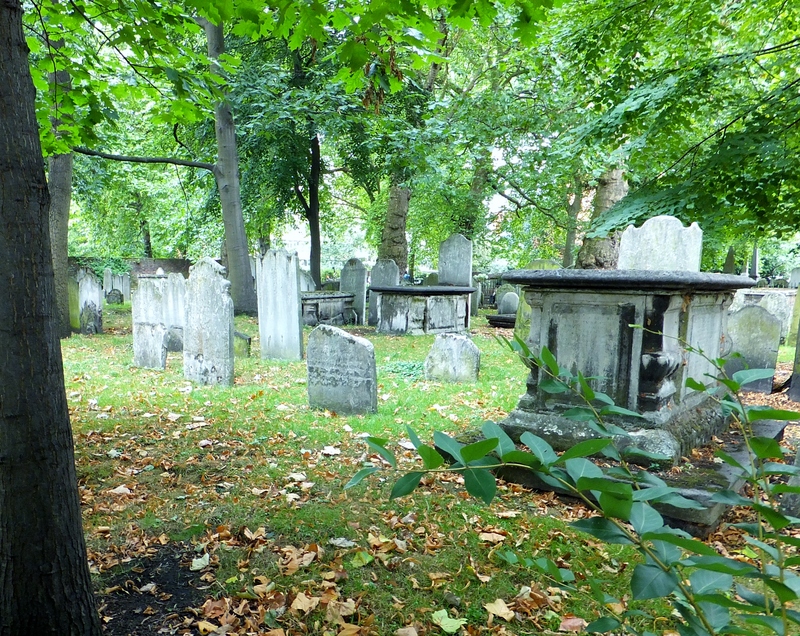 He was buried in the Bunhill Fields Cemetery on Dec 16, 1802…Piece 3989: Bunhill Fields Burial Ground, City Road. Bunhill was in use as a burial ground from 1665 until 1854, by which date approximately 123,000 interments were estimated to have taken place. Over 2,000 monuments remain. It was particularly favoured by Nonconformists and contains the graves of such notables as John Bunyan, Daniel Dafoe, William Blake and Isaac Watts. 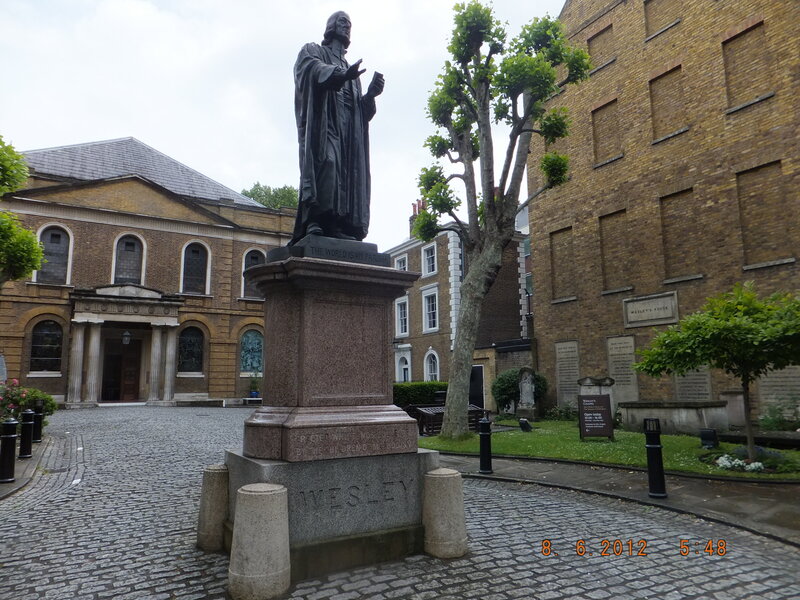 Just across the street is John Wesley’s Chapel. Daniel Spencer Mason went on to become a Draper and had a shop at #107 Shoreditch High Street. According to the 1841 Census he had a house he shared with his sisters Mary Ann Finch (widow) and Ann Mason at New Norfolk Street not far from St. Mary’s Parish Church in Islington. This area was destroyed by bombs in WW2 and the house is no longer standing. 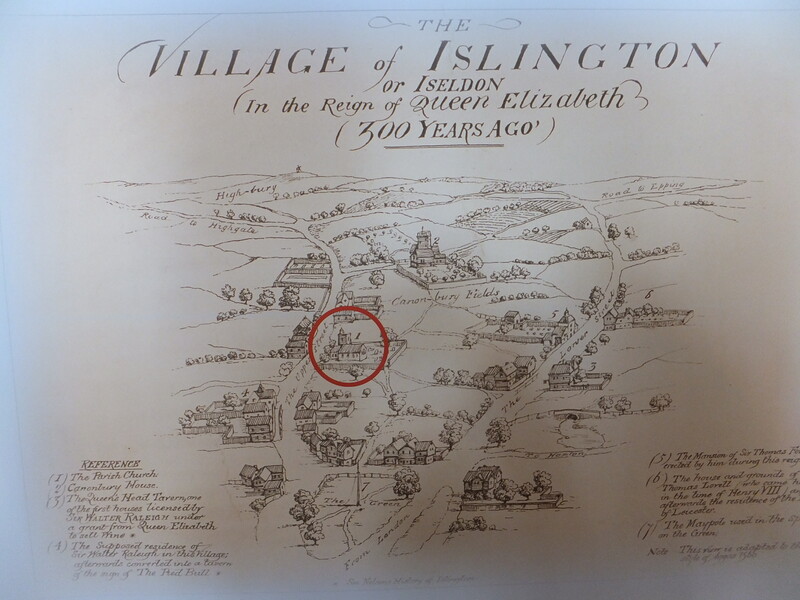 Islington is mentioned in an early Anglo-Saxon charter and was originally named Giseldone, then Gislandune. The name means ‘Gisla’s hill’ from an old Saxon personal name Gisla and dun meaning ‘hill’. According to one early writer, it was a savage place, a forest “full of the lairs of wild beasts”, where bears and wild bulls roamed. On the edges of the forest was a pasture for hogs. In The Domesday Book of 1086 the name had mutated to Isendone, and then Iseldone, which remained in use until the 17th century when it was replaced by the modern form. In the Middle Ages, most of the land belonged to religious institutions. After the dissolution of the monasteries (1536-1540), much of it was given to aristocratic families, often the friends of the Tudor monarchs. By the 17th century, Islington had grown from a hamlet into a village, spreading along Upper Street and Lower Road, which later became Essex Road; by the 18th century, the area had become became famous for its dairy herds, which supplied London with butter, cream and milk. London grew rapidly in the 19th century and brick terraced houses began to take over the agricultural land. Local farmers turned to manufacturing bricks and developing property. 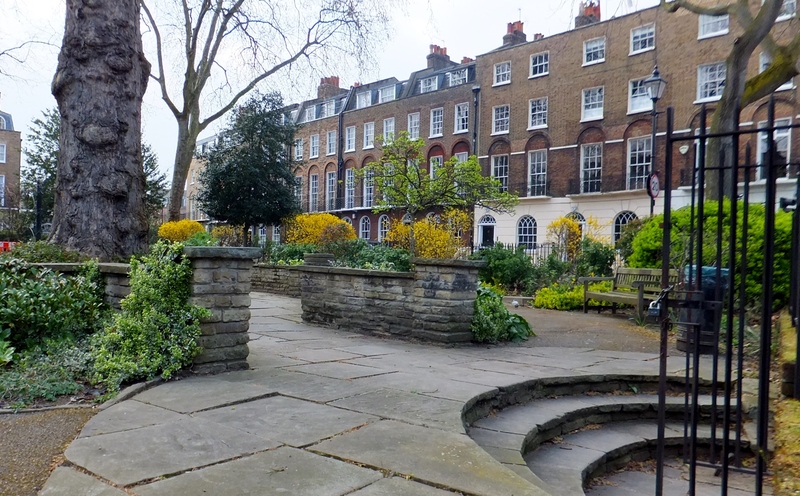 Canonbury Square is an attractive square, developed between 1805 and 1830 and included a variety of distinct styles. 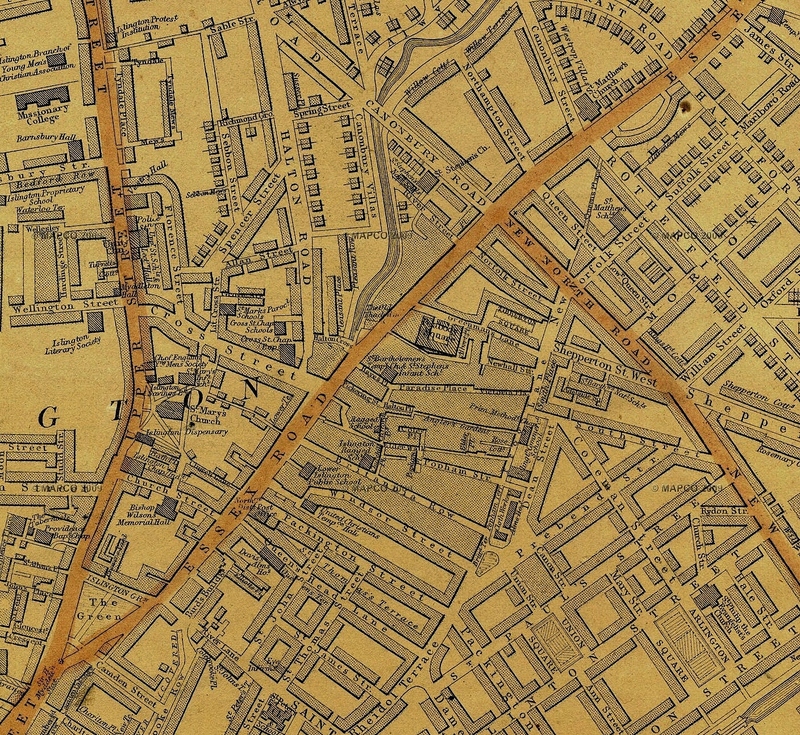 In 1812, when few properties had been built, the New North Road turnpike, now known as Canonbury Road, was constructed and bisects the square. Many significant figures from the arts and literary worlds have lived on the square, including George Orwell (1944) and Evelyn Waugh (1928). The Mason Family lived at New Norfolk Terrace, not from here. With the advent of the railways came industrial development and corresponding social decline. Eventually, many big houses and once elegant squares fell into disrepair. For much of the 20th century, Islington was a poor, down-at-heel area. However, post-Second World War rebuilding and later gentrification improved both housing standards and the appearance of local streets. 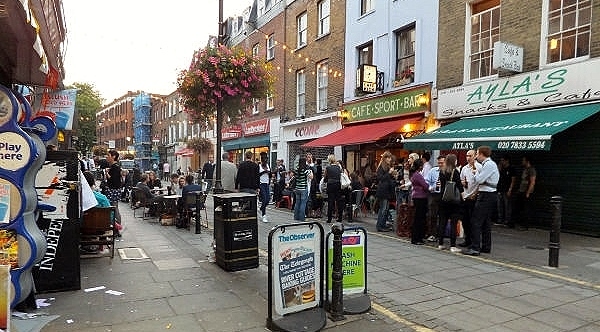 In recent decades, although some significant social problems remain, Islington has become a desirable residential area, as well as a place to head for leisure and entertainment. Run-down establishments have given way to smart restaurants, local theatres, galleries and shops, whilst new shopping centres have grown up at Angel and Nag’s Head. Properties now range in the 700,000 to 5.5 million pounds if they have been restored. 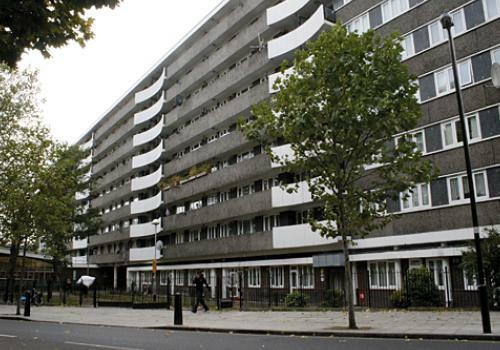 Finsbury Estate, one of a number of large Public Housing Estates, is next door to Rosebery Hall. When I first visited in 2010, I was kept up at night with noise made by the local teenage residents, gathered on the street corner under my window. Drug deals and fights went on all night. The area has been cleaned up in recent years with surveillance cameras and police patrols. The development includes a library and the Islington Museum which opened in 2008 below the library. Bob…The Street Cat who along with his owner James, Busked outside the Angel Station. Islington has had a host of noteworthy characters over the years. Bob and James, a man and his cat are only some of the latest. They became famous worldwide after their books “A Street Cat named Bob” and “The World According to Bob” were published. Instead of keeping warm in Waterstone’s Book Store at the north end of Islington Green, they came to sign their books. 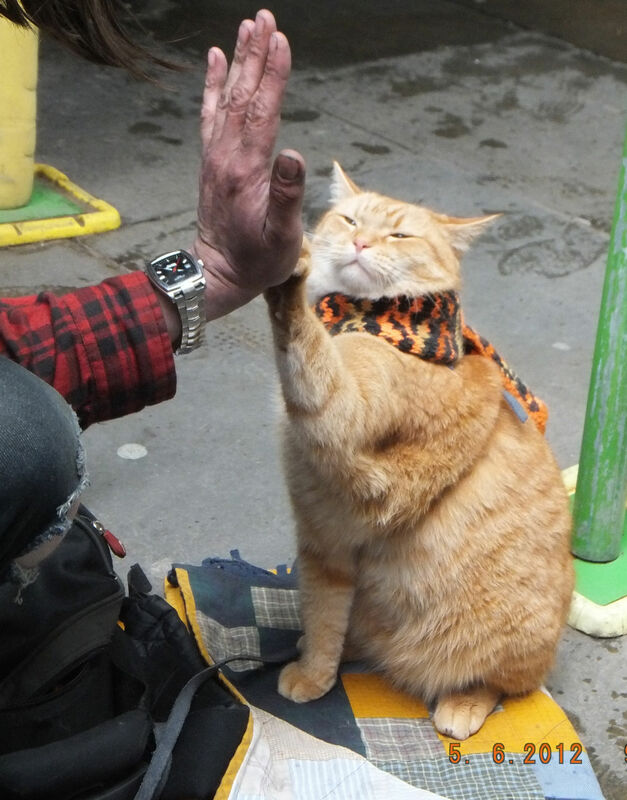 If you are not familiar with their story…it is one of love and how one stray cat helped a man who had spent 10 years on the London streets as an addict, begin a new life. James in turn, had rescued Bob after he wandered into his flat, sick and worn. The Sadler Wells Theatre is also a neighbour of Rosebery Hall. It is a performing arts venue and the 6th on the site since 1683. Patrons were gathered outside one April evening as I returned home, enjoying their drinks in the warm spring London weather. I laughed when I saw some patrons arriving on their bikes which they locked up against the lamp poles. This is not something that happens at such venues back home. 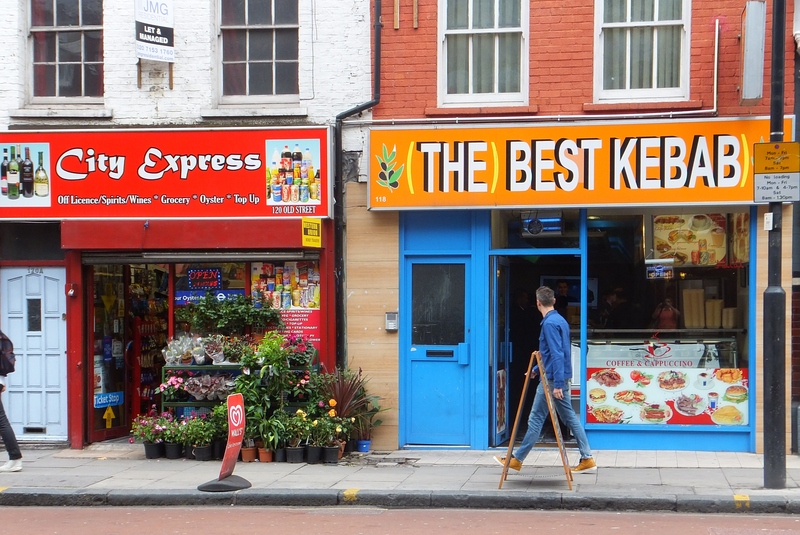 Not far from Rosebery Hall is Exmouth Market..a pedestrian friendly street with Shops, Cafes, Restaurants and Pubs. On a Friday night it gets very busy as the young people come out to celebrate the end of another work week. 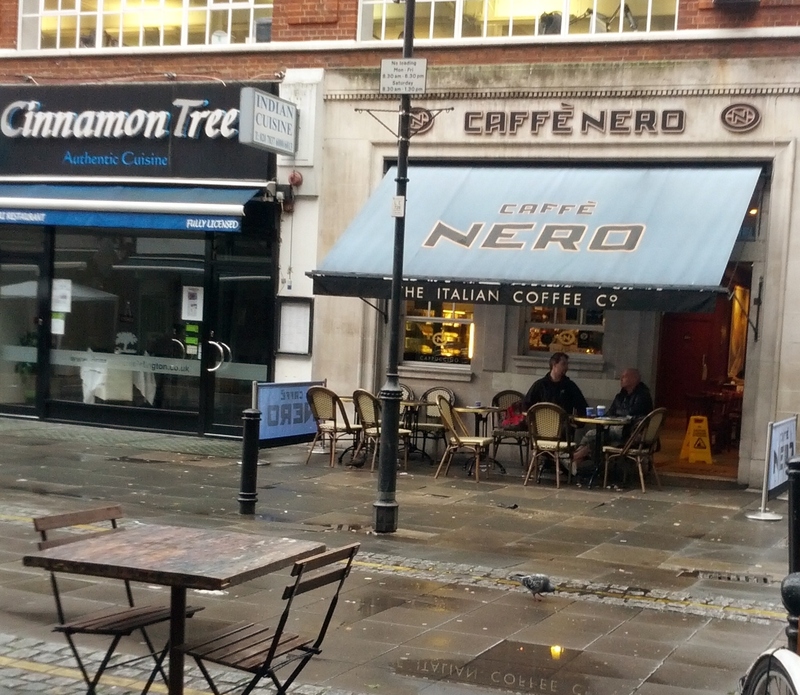 My favorite Cafe is Cafe Nero at the end of the street. It is here I usually have my final coffee as I head to catch the #63 bus which will take me to Kings Cross to begin my long journey back to Canada. I keep the Coffee Card in my wallet as I know it will be only a matter of time before I am there once again.